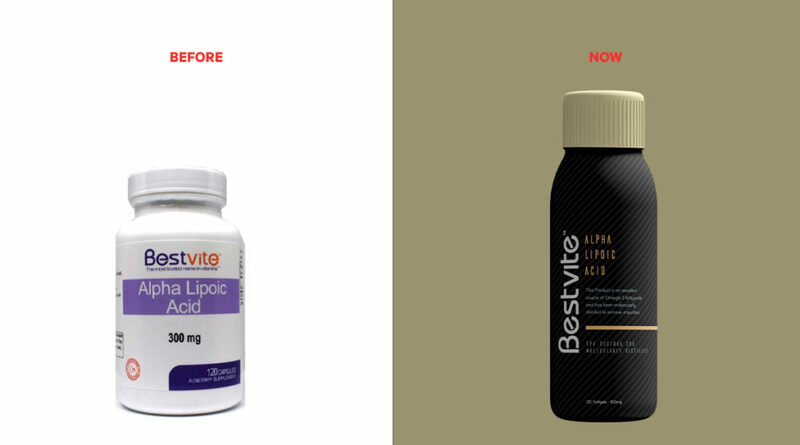 Bestvite is a health and nutrition brand geared towards providing the highest quality health supplements and “functional foods” at affordable prices. Bestvite’s stated mission is to create vitamin, mineral, herbal, and natural food products that are among the purest, yet also ensuring these products are affordable to the vast majority of consumers. Their mission is clear: to be the best value in an industry famous for price-gouging. Bestvite products are encapsulated in the United States and undergo regular laboratory testing before they are shipped to customers. 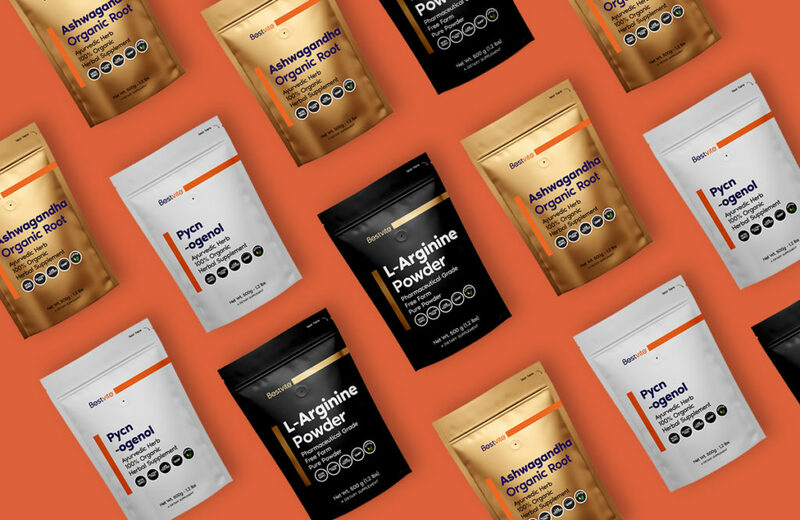 Over 90% of the brand’s products are made with stearates, a food-stabilizing additive that is known to suppress immune system function. Since its first launce in 2005, Bestvite had not yet refreshed its brand identity. The dual-toned logo did not work consistently across all platforms (packaging, web, mobile app, etc.). And, the existing bottles failed to present an image of energy and vitality. Each product within the brand’s lineup also had an inconsistent appearance. The solution to the brand’s fragmented presence was to give it a fresh new look, starting with the color palette. 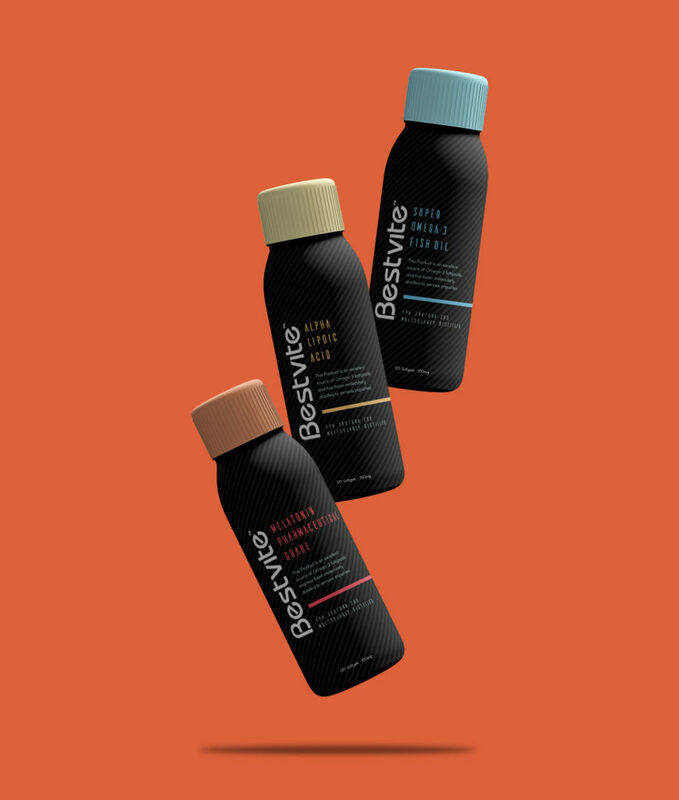 Each bottle of Bestvite was redesigned with black as the primary color. This symbolizes the nutrient density and quality of its products. Next, the logo was redesigned to be monochromatic, giving it more flexibility across a variety of platforms. Since the packaging conveyed the brand’s message, the tagline “The most trusted name in vitamins™” was also removed from the logo. Each of the pouch-based products was given a unique look to differentiate the various products from those of its competitors. There was also much thought put into establishing product volumes and quantities that best represented the frequency in which consumers actually used the products. This not only makes the products more economical and practical for consumers, but also simplified the production process for Bestvite. During this almost-10-month redesign process (from consultations to final product approval), many design variations were tested until we arrived at the best result. The redesigned packages garnered two awards from industry websites favourite-design.com (Favourite Designer of the Day) and packagingoftheworld.com(Best Packaging).